Three of Cups Tarot Card Meaning - All Explained HERE! The Three of Cups is the third card in the Cups suit. The card shows three people meeting, celebrating with cups held to the sky. A bounty of fruit and vegetables are by their feet. The scene is representative of a harvest festival ritual celebration, and gives off a good feeling. The Three of Cups is a good card to draw in almost any position. 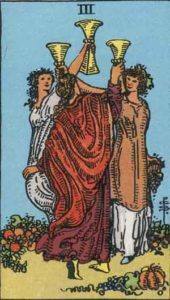 The Three of Cups represents community, success and reunions. Past – The Three of Cups in the Past position could suggest a past period where you had everything you needed. This time of abundance is paying off now. Maybe you put a lot of work in and achieved something in your workplace which people admire you for. Maybe you have helped a lot of people in the past who will soon appear to pay you back in kind. Maybe you took care of your body, and now you are in very good health. Think back at the things you have achieved and how they are paying off now, but also, consider what you can start to do, today, that will pay off for you in future. Present – The Three of Cups in the present position can mean that you’ve just finished something great. A personal project has been completed, or something that has had a lot of time put into it is over. Consider the illustration. They have worked all year to raise the harvest and it’s finally over. This should be you. As the past definition implies, look to start something which you can work on, which will pay off in future. The farmer sows seeds hoping for a bountiful harvest. Look to where you can sow seeds in your life; work, school, friends, adventures, experiences, charities, helping others. Future – The Three of Cups in the future position gives you something to look forward to. We’re always doing projects and working hard. There is always something new. The cycle of work and rest is a balance we will continue to experience. It’s possible you’ll run into some old friends. Maybe you even have a reunion coming up. You should always try to connect with those from your past, you never know where these connections will lead. Work / Education – The Three of Cups in regards to work or education suggest the success of a project or exam. Things should be going very well in these areas. If there is something big coming up; a project at work or school, or an exam, then make sure to throw yourself into it fully. Dedicate yourself to getting the work done well. We all know that hard work does pay off. Romance – The Three of Cups in romance is a good sign generally. Be wary that this card can also signify a birth. Are you trying for a baby? If so, it’s good news for you! It’s possible you might reconnect with an old romance during the near future. It can be that you’ve both grown since you last knew each other, and circumstance could be that you’re right for each other again. Friends – The Three of Cups in regards to friendship has a specific meaning. You may meet somebody from your past. Usually this is a good sign, but if you can think of nobody, just be aware of it. Sometimes people come back into our lives who aren’t welcome, but these things are a lesson to learn from. Conversely, somebody that you used to dislike might appear in your life. Try to treat them as a new person. We all grow and change over the years. You sometimes have to forgive past mistakes others have made. Money – The Three of Cups in regards to finances can mean that you’ve just received more money than you usually have. Don’t waste it. Treat it as a good harvest that must last you through the winter. Things may get rocky in the future and you’ll need to depend on it. Save. If you are comfortable with it, then try to make the money work for you. Invest, save for a long time, or purchase something that will pay off in future. Health – The Three of Cups can mean a transition in your mental state and physical well-being. Look into interesting new exercises or routes to take to places you go regularly. Working with others would be a good idea. it’s likely that you are going to be in good health in the coming months, so at least you can alleviate yourself from worry in this aspect. Spirituality and Mentality – The Three of Cups in spirituality gives off a giving vibe. Volunteering or helping your community will be really good for you now. Creating a sense of community and family can change how people perceive you. If you give, then people will give back. Try to go out of your way to make others happy. You know in turn that no bad can come of it, and they may even reciprocate the gesture. In reverse, the Three of Cups leans towards a lacking, or a failed harvest. You may have tried at an endeavour, and it failed. There are still lessons to learn. Remember, that those who are good at something have failed more than others have even tried. You might have lost a lot of connections from your past, but that doesn’t mean the end of the world. there are still new people to meet. make sure you do not wallow on the bad experiences, just learn from them. Three is a powerful number in numerology, and grounded in the material world (three dimensions). Creative, and stable, three can represent our life as birth, living, and death. The Three of Cups in a numerological sense reminds you that you may have just completed or be nearing the end of a cycle; something memorable has just happened in your life. It’s closed and contained and you can learn from it and move on. We’ve selected live tarot readers to give you a FREE 3 Minute interpretation of The Three of Cups! Scroll through them below and pick your favorite one.